So I waited. I waited for light to creep over the countryside and the sky to clear. Finally, the sun peeked above the red barns of Brant Lake Farm, a yellow sphere in the azure sky, but, across the lake, off to the west, the remains of a full moon still hovered, a faint imprint on the sky. The sun and the moon shared the heavens. It was that moment of transition between night and day. The seasons also paused in transition—suspended between late summer and early fall. The temperature fluctuated between 70 degrees midday and 40 degrees at night. Summer was not yet willing to relinquish its grip but fall eagerly anticipated its arrival in the eternal passage of the seasons. When the day brightened, I lowered myself onto the wicker seat in the middle of the canoe and glided through lily pads where a school of minnows swam. 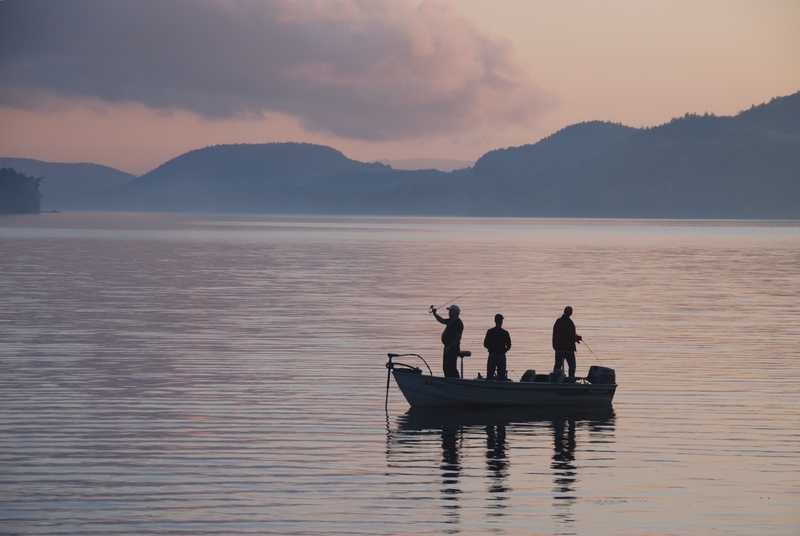 Nearby, framed by Pharoah Mountain, three fishermen cast into the waters. Every day, at sunset and dawn, they dropped the anchor of their small gray fishing boat, searching for elusive bass. Or maybe it was a brown trout. Usually they wore torn T-shirts. On this morning one dressed in a red and black plaid shirt, another in a flannel khaki shirt. Woolrich. It was cold. 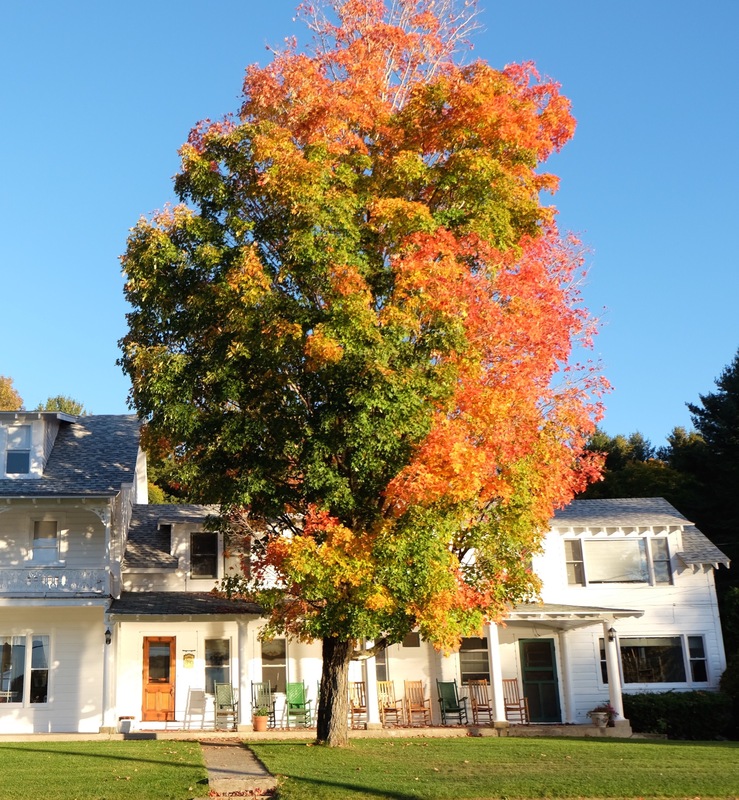 As I approached Sunset Mountain Lodge I noticed the stately maple had begun to turn. A branch of red leaves nestled against a green backdrop. Soon the tree would be entirely red and the leaves would fall. Not far off the bow of my canoe a loon swam towards Point O’ Pines, then paused and turned in my direction. The loon rose out of the water, as if standing on its feet, and flapped its wings to greet me. I saw the white underbelly before the loon dove into the depths. I waited for the loon to surface, but it remained hidden. I would not receive another visit from that loon. It was gone. Only the memory of a farewell wave would warm me in the depths of winter. I did not want summer to end. Especially this year. Was it because I had already experienced a vast myriad of seasons and now time seemed to hurtle forth at breakneck speed? Or is there always a veil of melancholy, a bittersweet aura, at the advent of autumn? Who can explain? But this I know: It is better to long for more than to say, “It is enough.” Another summer will come— and Brant Lake will be sanctified by a springtime of rebirth. For that is the cycle of life. October 9, 2016 in Brant Lake. After watching part of the last Presidential debate, your piece on the end of Summer provided a most welcome relief. .
And every autumn, despite all the changes of recent years, I -and many others I’m sure – look forward to seeing you and hearing your sermon on Yom Kippur.